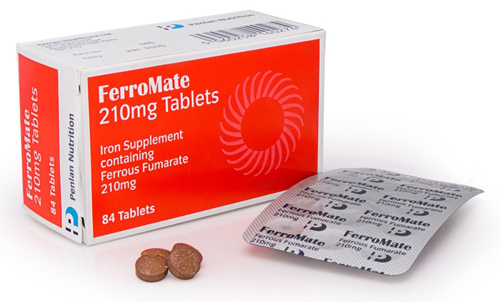 FerroMate® (Ferrous Fumarate) is used for supplementing iron in the diet and preventing or treating low levels of iron in the blood. It also may be used for other conditions as determined by your Doctor or healthcare professional. Contact your Doctor or healthcare professional right away if any of these apply to you. Use FerroMate® as directed by your Doctor or healthcare professional. Check the label on the package for exact dosing instructions. FerronMate® is absorbed better on an empty stomach but may be taken with food if it upsets your stomach. Some foods (eg, eggs, whole grain breads, cereal, dairy products, coffee, tea) may decrease the amount of iron absorbed by your body. Talk with your Doctor or healthcare professional about the best way to take ferrous fumarate with food if it upsets your stomach. If you take an antacid, a bisphosphonate (eg, alendronate), cefdinir, eltrombopag, methyldopa, penicillamine, a quinolone antibiotic (eg, ciprofloxacin), or a tetracycline antibiotic (eg, minocycline), ask your doctor or pharmacist how to take it with FerroMate®. Take FerroMate® with a full glass of water. Do not lie down for 30 minutes after taking FerroMate®. If you miss a dose of FerroMate®, take it as soon as possible. If it is almost time for your next dose, skip the missed dose and go back to your regular dosing schedule. Do not take 2 doses at once. Ask your Doctor or healthcare professional any questions you may have about how to use FerroMate®. Do not take large doses of vitamins while you use FerroMate® unless otherwise directed by your doctor. FerroMate® has iron in it. Before you start any new medicine, check the label to see if it has iron in it too. If it does or if you are not sure, check with your Doctor or healthcare professional. FerroMate® may cause darkened or green stools. This is normal and not a cause for concern. Constipation; dark or green stools; diarrhea; loss of appetite; nausea; stomach cramps, pain, or upset; vomiting. Severe allergic reactions (rash; hives; itching; difficulty breathing; tightness in the chest; swelling of the mouth, face, lips, or tongue); black, tarry stools; blood or streaks of blood in the stool; fever; severe or persistent nausea, stomach pain, or vomiting; vomit that looks like blood or coffee grounds. This is not a complete list of all side effects that may occur. If you have questions about side effects, contact your Doctor or healthcare professional.